In planning towns and cities, how carefully do we consider what might be beneficial and pleasing for people in their teens? BRISTOL — None of my colleagues know I used to skate, and very few of my friends. But it still hangs to me, another thread constituting the whole, to be tugged upon when something reminds me of it. A reminder came recently. The Southbank Centre in London is a high-profile set of arts venues — most notably, the Royal Festival Hall, Queen Elizabeth Hall and Hayward Gallery — that overlook the River Thames. The buildings, some of which might be described as brutalist concrete architecture of a fine pedigree, began to be built in 1951 for the Festival of Britain, with most work carried out in the 1960s. 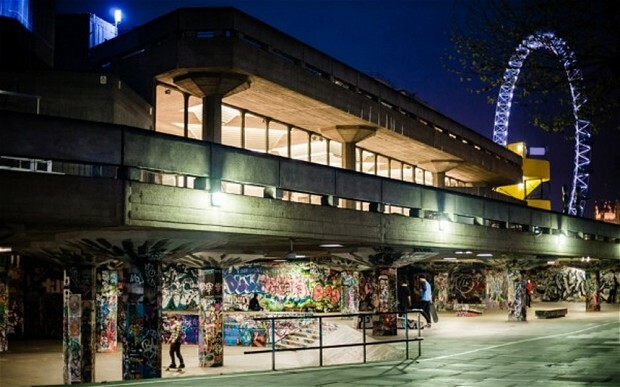 However, for reasons that have never been made clear, a void below the Hayward Gallery was created, an undercroft, and it is this undercroft that has been apprehended by skateboarders, keen to ride its paving-slab banks. They came from the bustle and glitz of Sydney, and their influence was transformative. 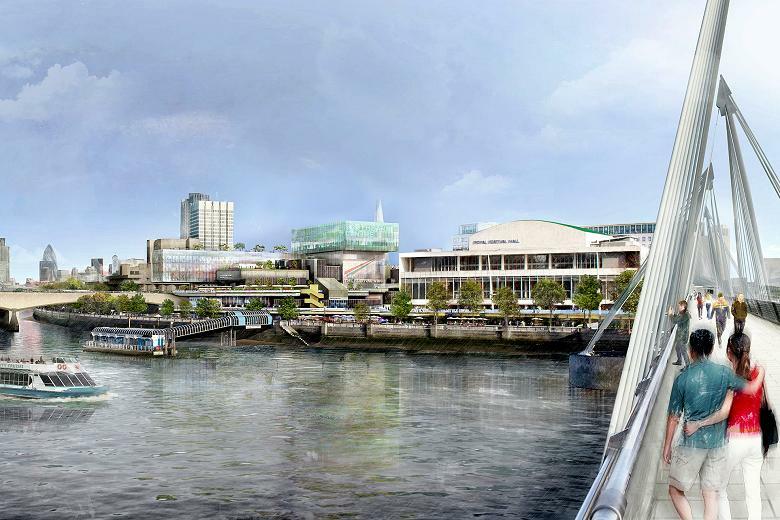 The Southbank Centre's recent plans for expansion included a redevelopment of this area to incorporate cafés, bars, and other high-revenue streams. The skaters (whose use of the space dates back 41 years), were appalled. The story made the headlines, and my interest in the place, and that of skateboarding in general — like trapped gas making it to the surface in a burst of pale flame — was reignited. I grew up in a small Buckinghamshire village named Lillingstone Lovell. It was lonely. Well, perhaps not lonely, maybe solitary. There was no one of my age, and there was no easy way out of the place. My father would work all-hours, and for many years my mother didn’t drive. Our family lived in an old thatched cottage, near a Medieval church, which served as the village's centre-point. I went to schools three, five, then eight miles away, but it might as well have been a hundred. My brother is four years younger, which sometimes felt like an enormous gulf between us. I derived happiness, or contentment at least, from walking and cycling the lanes and fields roundabout. I kept nature journals in which I documented things I had discovered — strange flowers, oak apples, minnows — and in the back pages were a selection of collectables — feathers, leaves. One vivid memory is of a dry summer when I took the family dog on long walks through the lush rolling pastures, he and I tracing the temporarily waterless brook towards its source in Northamptonshire. When the tall city-centre trees were felled, rather than disperse the crows, they continued to congregate in the same place. From the description given, the village may appear like a rural idyll, but I wasn’t aware of such notions. It was merely home, the place where I lived — and I did my best to take advantage of what was available. For the most part I got on with things — not taking much heed of what friends and strangers might be doing in towns and cities. Abruptly, things changed. I started skateboarding in the late 1980s when my two Australian cousins and their parents had decided to relocate to the UK and were staying with us. They came from the bustle and glitz of Sydney, and my cousins' influence was transformative. 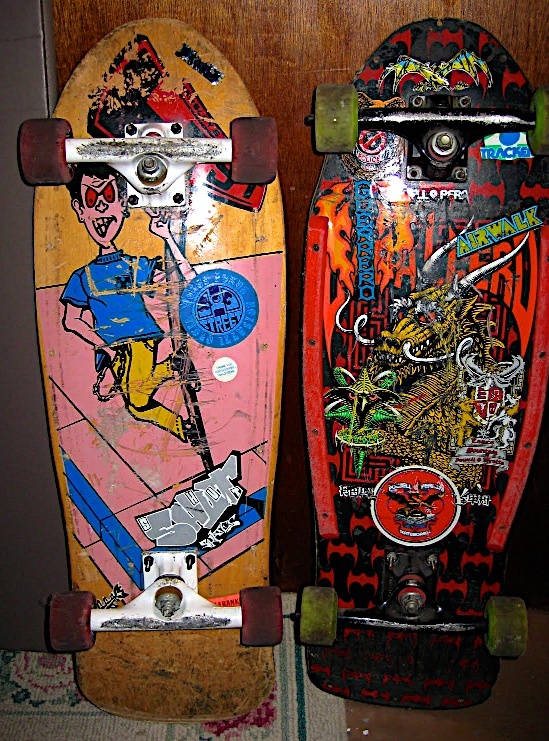 The older of the two cousins was my age, and they shared a board, an El Gato pool deck: rigid, concave, and with a cherry-red-stained graphic on the underside that was incredible, especially alongside my cheap and distressed pale imitation. 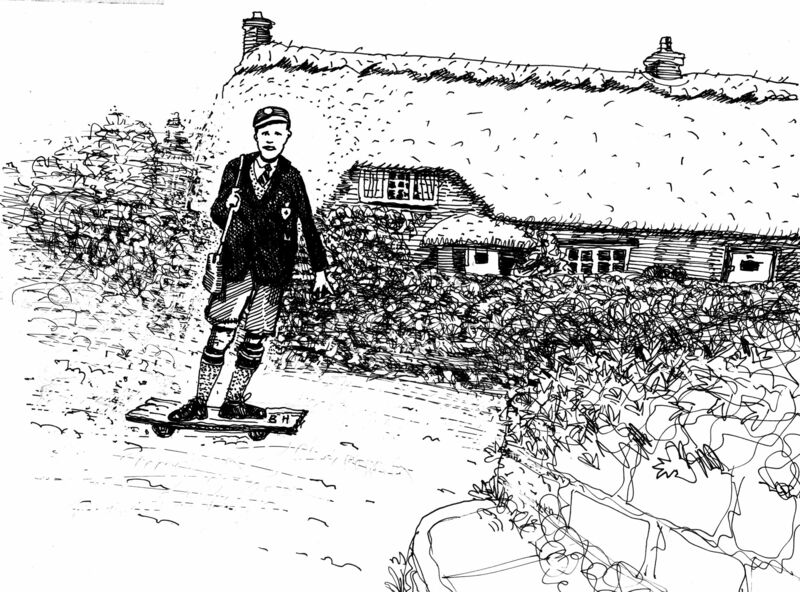 "Skateboard Pastoral" by Brad Harley. We had a large garden then, and my cousins — who no doubt were used to fine purpose-built skate facilities — soon set about plans for making a ramp in the yard. Our first attempt, four fence posts in the ground with a sheet of plywood between, was a failure; there was no support under the ply: so the wood contorted wildly, and the fence posts fell. It was funny and ridiculous, our efforts, and with hindsight it was plainly obvious it wouldn't work. Our next attempt, some pallets as support under the ply, set at 45 degrees to create a half-pipe, faired better. However, once we were bored, we needed something more exciting, so we adapted what we had to incorporate a drop-in and two small kicker jumps. A mattress was laid out to cushion our second drop. It was fun, and alien too. Previously interaction with my surroundings relied on the already existing forms – the rolls of the fields, the tiny fish of the brook, the fruit trees in the garden. It was interesting for me to allow things to mutate and evolve. An architect's drawing for the redevelopment of the Southbank Centre (below)2. When my cousins moved away, as disappointing as it was, I realized that what they had given me kept me going. When they left I didn’t go back to my old ways — the skating bug stayed. The original plywood surface of our half-pipe had become broken and splintered, and each new ramp I made was only a smaller remaking of the former. I was involved in making something that was an exercise in necessity, and becoming tougher and more stable each time. My final ramp was a small quarter pipe which I would roll up and down again like a pendulum. I had saved some money and got myself a new fancy skateboard: a purple Black Label Crutch deck, with pink Deadbolt trucks, and orange Spitfire wheels. I consumed whatever skater magazine I could find. There was little in the way of urban furniture in the village, but there was a stone bridge over the brook. This provided the only kerbstones and pavement for miles around. The deepest section of kerb was about 5 inches tall and was the set for practicing grinds and board slides. Every day after school I would try to ollie (that is, jump) up the kerb, often resulting in me landing on the small of my back. When my Australian cousins visited my brother and I would head with them to Milton Keynes and try to outdo each other; I was the first to ollie down a set of steps. We’d race each other on the dreamily smooth marble and run from security when we overstepped the commonly held notions of privacy. It was always thrilling to make these trips; to try and impress my cousins with what I'd learnt since I last saw them. Meanwhile, there was Southbank. 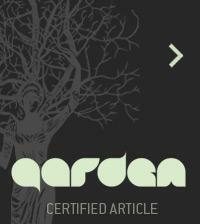 I'd read plenty about it, a place with so much buzz that the magazine images throbbed with energy. One day my mother decided we should have a nice day in London — a mile walk to a bus stop, a long journey to the rail station, a slow 70 mile clinker-clank of the Intercity train. She had her mind set on visiting Portobello market. I insisted we visit Southbank. How could I not? It was my counter-cultural adventure playground. I didn't have my skateboard, but that didn't matter. It was exciting to see something that at once loomed large in my mind, but also only partially unimaginable. The space at Southbank has always been contested. The powers-that-be actively discouraged skateboarding — they cut holes in the paving slabs and laid gravel on the floor. When I visited, they'd not long before erected hand rails at the base of some of the finest banks, rendering them unusable. But still the skaters came, and still, there I was, watching in awe, imagining what it might be like to ride those surfaces. Esther Woolfson, in her book Field Notes from a Hidden City (2013), talks about the dispossessed crows of Aberdeen — how when the tall city-centre trees were felled, rather than disperse the crows, they continued to congregate in the same place, and have done so for years, for generations.1 The Southbank skaters seem to have done much the same. I still see the potential of urban spaces to be used in ways other than those intended. Areas neglected, forgotten, ignored. 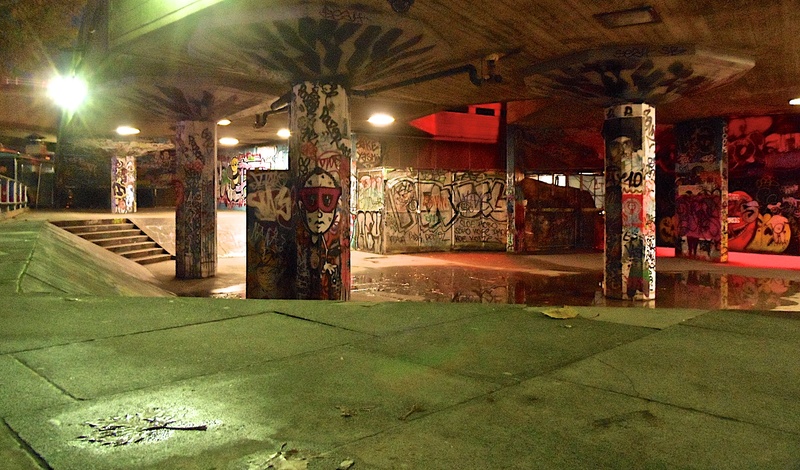 The undercroft at Southbank Centre: a private sort of public space. And from this ur-dog, to the ur-skateboarder. When I found out the skaters had won, that they were not going to be displaced, my pessimism that they might fail evaporated. I was overjoyed. I think back to our ad hoc attempts at ramp-building, the failed ollies and the grazed skin. I was part of something bigger than just the participating individuals. There was my cousins' and my brother's companionship, but also the knowing nods from unknown skaters. Even on my own, on the village bridge, I still had a sense of something larger; that there might be people just like me trying the same trick over and over. More than anything, I’ve come to believe that my initiation gave me a sense that, even if I still spent a lot of my time on my own, there was a larger world beyond the solitariness of the village. 1 Quoted in Skateboarding, ‘Space and the City,’ Iain Borden, 2001. 2 From 'First Things,' Philip Gross, The Water Table, 2009. ARTICLE: "Southbank's skatepark saved for the long term." Southbank Centre photos by Emma Bell. 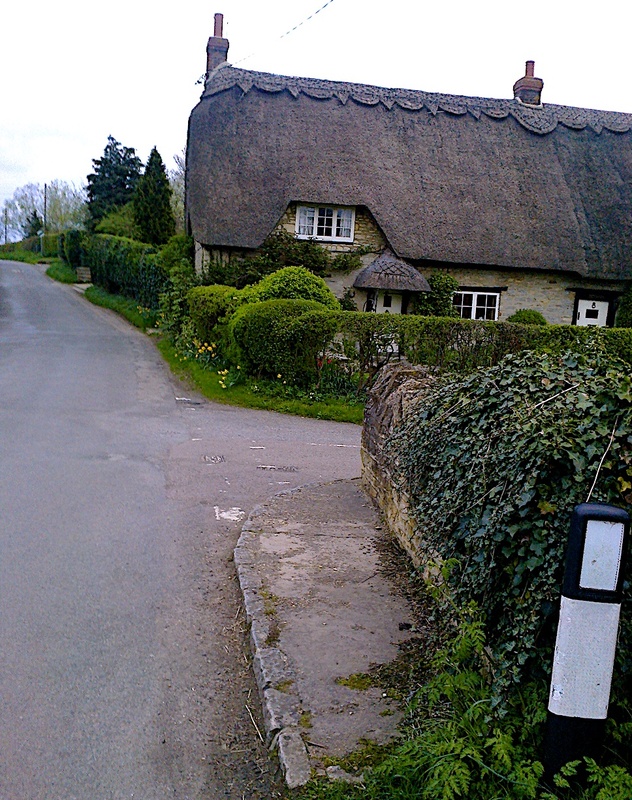 Photo of village cottage and kerbstone by the author. Tell Us About WIld Culture Near You . . .